The 26.84 metre Riva Florida motor yacht, listed for sale by Monaco Boat Services, has been sold with Henry Schonthal at Reel Deal Yachts introducing the buyer. Built in GRP by Italian yard Riva with delivery in 2015, she takes her design cues from the automotive industry and is the third hull in the Riva Florida 88 series. Accommodation is for eight guests in four en suite double cabins with quarters for two crew. Her outstanding feature is a convertible top and the hull profile is truly unmistakable thanks to the innovative continuous glazing. The large windshield and a steel roll bar complete this new yacht’s design. The sight of the convertible hardtop on the Florida 88 lifting off and swinging into its storage recess on the foredeck will surely leave onlookers open-mouthed. Two electro-hydraulic arms emerge from the sides of the forward coach roof, pivot backwards, pick up the cockpit roof, swing it forward, lower it into its storage position over the seating area on the foredeck, then tuck themselves back into their respective stowage pods. Living areas are filled with light, thanks to the extensive use of glass and there is a large saloon below with comfortable seating for up to 10 guests plus a state of the art entertainment centre including a flat screen television set. Outside, the aft cockpit comes with al fresco dining facilities along with sun pads aft and there is an extensive list of extras including a full yard warranty. Twin 2,435hp MTU diesel engines power her to speeds of up to 38.5 knots. 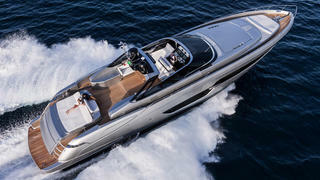 The Riva Florida 88 was asking €6,150,000.